The Phillies took 3 of 4 games from the Dodgers this week, ending with last night’s 7-3 win. The only game they lost was in Cole Hamels’ return from the DL. Hamels pitched well, but once again, the bullpen blew the lead. Ugh. Yesterday’s win was much more pleasant, although nerve-wracking at times. Kyle Kendrick pitched pretty well considering he allowed 10 hits and a walk and only 2 runs scored. He would have gotten the win, except Mike Adams immediately gave up the lead in the 7th with a home run ball to Adrian Gonzalez. Adams pitched 2 innings for which he earned BOTH a blown save AND the win. Go figure. This is a perfect example of why I hate the win/loss rules for pitchers. Speaking of rules I hate, let’s talk about home plate. This no blocking the plate, anti-collision thing is officially on my last nerve. Tony LaRussa, the former manager who fought for this rule, can take his big ideas and stick ‘em where the sun don’t shine. Yet another play at the plate was challenged last night when the Dodgers purported that Carlos Ruiz did not give Hanley Ramirez a lane to the plate. I guess they thought the edge of the nail of his little pinky toe was touching the imaginary parallel line from his foot to where the plate meets the dirt? I am exaggerating, but how utterly ridiculous is all of this? Ramirez was still called out after review, but this brings up a bigger issue. Why would anyone NOT challenge an out call at home plate with this rule in place? Seriously. 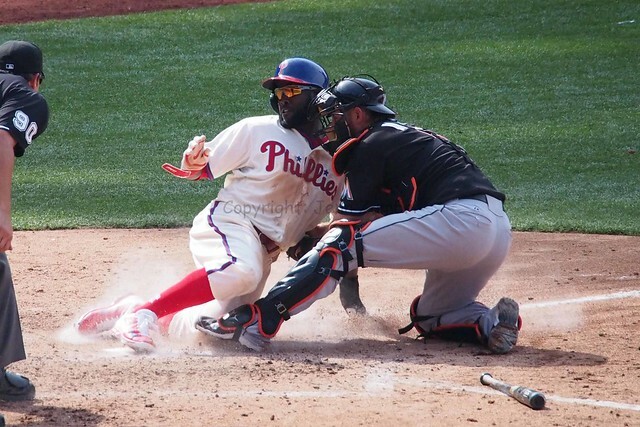 There is a very high probability, as we have seen in previous Phillies games, that they runner will called safe. Because it seems that if even a small part of the catcher is in front of the plate before the ball arrives, he has been a bad boy and thus unworthy of an out call. This means EVERY out call should be challenged. Complicating matters, no one is exactly sure what the rule really is. On April 13th, the Phillies lost a run due to a replay review at home and Tony Gwynn Jr. was called out. The next day, MLB called to apologize for getting the call wrong. If the people in charge do not even know the rule, how is anyone else supposed to? Besides that, the rule is insane to begin with. I understand they want to limit injuries and all that, but it seems to me this is likely to create MORE injuries. If the catcher cannot be in front of the plate until he gets the ball, this forces the catcher to move very quickly and awkwardly from the point where he catches the ball (away from the plate) to the point he makes the tag (in front of the plate usually). This “sweep” tag is fine when the catcher is not overly concerned with where the end of his foot might be. But this rule will force guys to be even further away from the plate to make sure that little toe is not considered an obstruction, turning a “sweep” into an outright dive to make the tag. Not allowing the catcher to properly set himself means any type of collision will be made worse as he won’t be braced for it. The runner is not allowed to charge or go out of the way to hit the catcher, but in making a tag, avoiding a collision of some kind is nearly impossible. So please, please just go back to the old rules and add a clause that runners cannot charge or take cheap shots. Or here’s an idea…forget the tag altogether. The runner and catcher can just meet at home plate and thumb wrestle to determine the winner. Much safer. Or rock, paper, scissors anyone? Food for thought. It has already been reported that MLB is going to make “adjustments” to the rule, but no word yet on specifics. I will assume thumb wrestling is probably not an option. They are no fun. But let us hope they do not screw this up further. The Phillies begin a series tonight in Arizona against the Diamondbacks. Game time is 9:40pm.